Tired of the System run by the corrupt that protects the corruption? You could call Batman. Or you could find Dylan Hunter. 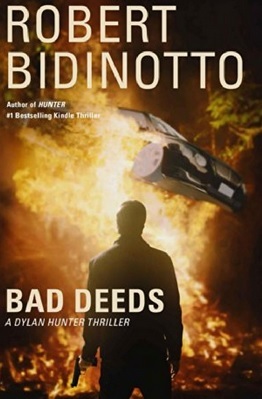 In Robert Bidinotto‘s Hunter, we were introduced to investigative reporter Dylan Hunter who has, let’s just say, a bit of a past. Nor does he like when the criminal element gets away with murder. In Bad Deeds, we find Hunter and his woman friend Annie on a much needed holiday in the towering forests of northern Pennsylvania. It’s not long before they find themselves in a middle of a war as ecoterrorists attempt to take down the evil corporate gas drillers. Soon, the trail leads to the cesspool of corruption known as Washington, DC, where the Hunter finds himself up against those who will do anything to cling on to power. They believe themselves untouchable. Hunter may have a thing or two to say about that. Is this second installment, Bidinotto has built on the first and taken the story to a new level, as any sequel should. Readers find themselves in a “ripped from the headlines” tale that is all too plausible. Political games and money trails are all too the norm in our world. As are cover-ups and the near immunity of politicians from the rules the rest of us play by. This all unfolds in a page-turning fashion that exceeds Hunter’s last adventure. Of course, in the tradition of all memorable thrillers, Hunter finds himself in some over-the-top situations. At the same time, there is much to provoke thought in the thinking reader. When will more people become fed up with the status quo? Maybe not necessarily in the way Hunter goes about justice. Then again, when are we going to stop letting the corrupt define justice? Wow. Thank you so much, Darrick, for this generous review! Much obliged.